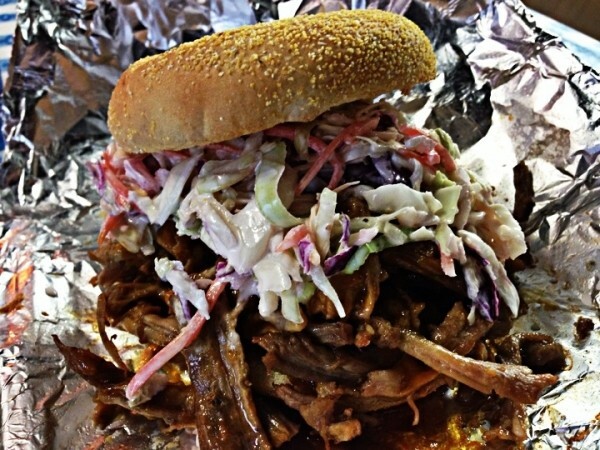 A pulled pork sandwich topped with a pile of slaw. A highway drive through South Carolina’s Low Country isn’t just the means to a destination; the journey itself is an experience. You’ll pass shops, eateries and peach-cider stands. Nothing, however, stands out more than the barbecue. They know how to make it. My nostalgia for the South is ever-present, and coming across a Carolina barbecue joint in Salt Lake City really took me back. Charlotte Rose’s Carolina BBQ was opened in October 2013 by Trae Eller, a 20-year veteran of the restaurant industry. You can order barbecue pulled pork or pulled chicken as a sandwich or a platter. You get your choice of two sides, but I’d recommend getting them all and then calling your cardiologist. There’s sweet-potato casserole, cornbread, red rice, green beans, baked beans and mac & cheese. For dessert, you can try housemade peach cobbler or a brownie. There are no apologies for the fact that everything is cooked with copious amounts of butter, salt, sugar, milk and fat. It all tastes great as a result. With a pulled-pork sandwich stacked high and topped with the most delicious sweet slaw you ever tasted, your choice becomes which sauce to put on top. This meat is so moist and tender that you might not even want sauce, but remember: This is the Carolinas, and some would argue that this is where barbecue began. The region has three wonderful sauces: tangy mustard sauce (originally from central South Carolina), spicy vinegar (eastern North Carolina) and sweet tomato (western North & South Carolina). These sauces enhance the flavor of the meat to a phenomenal level. In the Carolinas, no one’s a stranger. Trae Eller wants Charlotte Rose’s to embody the homey, friendly attitude of the South, and that’s what you’ll find—plus great authentic food.